During the Medicare open enrollment period from October 15 to December 7 each year, beneficiaries can enroll in a plan that provides Part D drug coverage, either a stand-alone prescription drug plan (PDP) as a supplement to traditional Medicare, or a Medicare Advantage prescription drug plan (MA-PD), which provides all Medicare-covered benefits including drugs. Part D plans vary in numerous ways that can have a significant effect on an enrollee’s out-of-pocket spending, including premiums, deductibles, cost sharing, tier placement, the list of covered drugs, and preferred pharmacies. This issue brief provides an overview of the 2018 Part D PDP landscape, the largest segment of the Part D marketplace, with 20.4 million enrollees in 2017 (excluding enrollees in employer-only PDPs, for whom plan premium and benefits data are unavailable). For detail on the data and methods, see the Methods section. For 2018, Medicare beneficiaries will have a choice of 23 Medicare Part D stand-alone PDPs and 17 MA-PD plans in their area, on average. The average monthly PDP premium will increase by 9 percent from 2017 t0 2018, to $43.48, weighted by 2017 plan enrollment. This estimate includes premiums for both basic and enhanced PDPs, assumes current PDP enrollees remain in their same plan, and makes no assumptions about plan choices by new enrollees or reassignment of low-income beneficiaries. PDP premiums vary widely across plans in 2018. 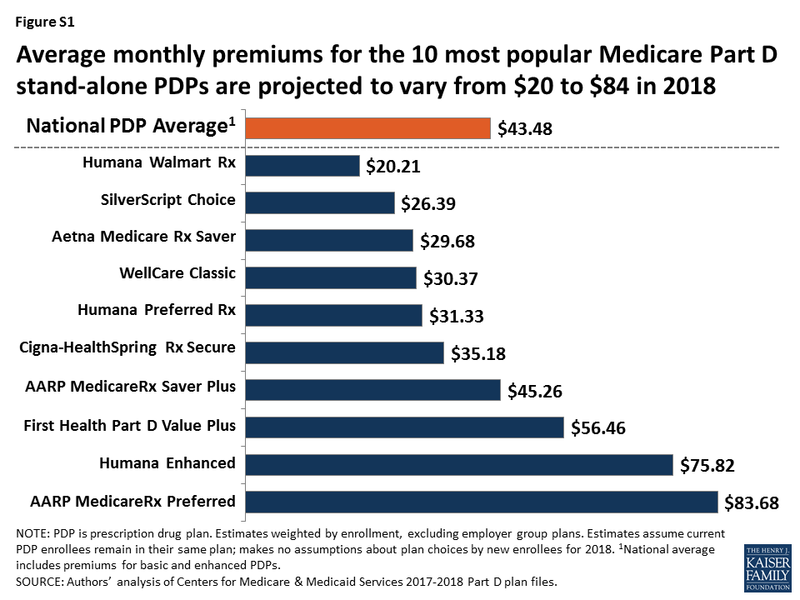 Among the 10 PDPs with the highest enrollment, average premiums will range from $20.21 per month ($243 per year) for Humana Walmart Rx to $83.68 per month ($1,004 per year) for AARP Medicare Rx Preferred (Figure S1). Almost all PDPs in 2018 have five cost-sharing tiers, but specific copayments and coinsurance rates vary widely across PDPs. Nearly all PDPs charge coinsurance for higher-cost specialty and non-preferred drugs, which usually results in higher out-of-pocket costs for enrollees than when plans charge copayments. Medicare beneficiaries receiving the Low-Income Subsidy (LIS) will have a choice of six premium-free PDPs in 2018, on average. In 2018, 1.4 million low-income beneficiaries who are eligible for premium-free Part D coverage will pay Part D premiums averaging nearly $26 per month, unless they switch or are reassigned by CMS to premium-free plans.